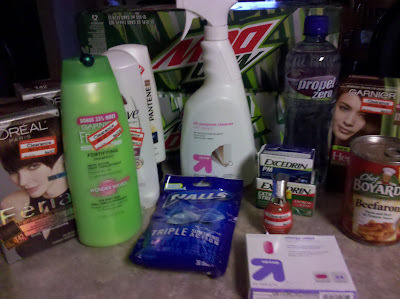 See what was Kim’s Target shopping cart today! Remember, you can use a Target coupon AND a manufacturer coupon (if both are available) on every item you purchase! You, too, can get all of the above items for only $5.61 + tax! Here’s a couple other deals I took advantage of plus I had free gift cards from my last Target visit to use, so I didn’t spend anything out of pocket! *They had a ton of hair color in various brands on clearance that I had coupons for, but no shades that I personally wanted. Check out We Use Coupons (as seen on Extreme Couponing) and Pocket Your Dollars for more Target coupon match-ups and Target deals valid this week.